I arrived home one night last week and came face-to-face with a platter full of ripe tomatoes and peppers. CRR was out of town, so I knew tomatoes and peppers were the answer to the what’s-for-dinner question. 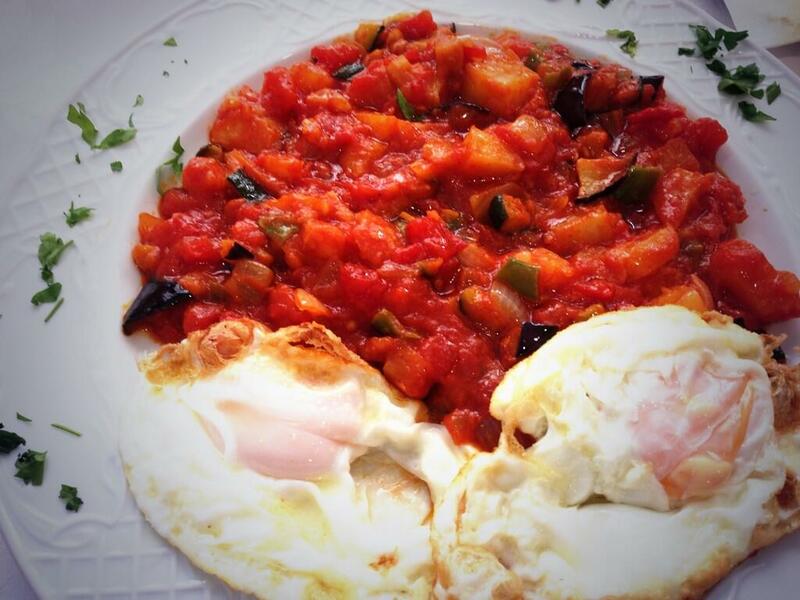 Then I remembered a recent tweet from @ChefJoseAndres about an attractive tomato & egg concoction. He’s one of my favorite Washington chefs, has a great story. Andres trained as a chef in Spain, came to Washington with little but his knives, and proceeded to build a culinary empire. His debut restaurant, Jaleo, helped put Penn Quarter on the map before the neighborhood was cool. A host of Andres restaurants are within a stone’s throw of my office: Jaleo, Oyamel, Zaytinya and Minibar. All are excellent, with a great vibe. Just a few blocks from Jaleo is DC Central Kitchen, a food bank that turns leftover food into healthy meals for the needy. Andres got involved with DC Central Kitchen soon after he arrived in Washington, using his celebrity to transform the food bank into a cause. Bravo, Chef. Now, back to that platter of tomatoes and peppers. His tweet was a photo of a traditional Spanish dish, pisto manchego. It can be served warm or cold, on just about anything, according to the recipes I consulted. I ate mine with a fried egg, as served by Andres. Heat 1 tablespoon olive oil in a sauté pan, add the peppers and onion and cook over medium heat until softened. Add the garlic and cook for another minute. Add the tomatoes, then a pinch of sugar to balance the acidity, cover, and cook until almost all the liquid is absorbed. Season with salt and pepper. Remove pisto to a pretty bowl and cover to keep warm. Fry one egg to soft stage, drape over the pisto. When you cut into the egg, the yolk will melt into the pisto. Enjoy. Nothing like fresh vegetables for your Pisto.